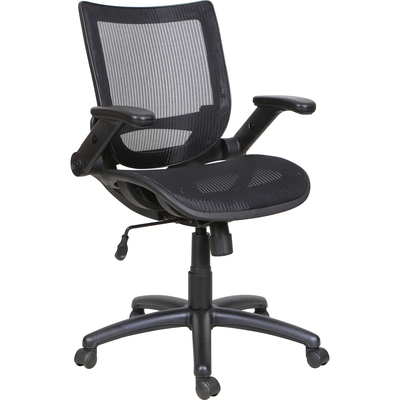 Enjoy Customized Comfort In This Mid-Back Mesh Task Chair. Breathable Mesh Seat And Back Conform To Your Body. Comfort Functions Include Pneumatic Seat-Height Adjustment From 17-3/4" To 21-5/8", 360-Degree Swivel, Tilt, Simple Synchro Tilt And Tilt Lock. Armrests Flip Up And Out Of Your Way For More Versatility. 13-4/5" Nylon Base Is Equipped With 1-24/25" Hooded, Dual-Wheel Casters For Easy Chair Movement. Seat Measures 20-1/8" Wide X 18-1/8" Deep. Back Size Is 18-1/4" Wide X 17-3/8" High..